Ruthiebear (Titusville, NJ, United States) on 2 October 2014 in Lifestyle & Culture. I thought for the month of October in anticipation of Halloween, I would return to Pennhurst . abandoned asylum. I took all of these images with the HDR setting on my camera. A magnificent picture in anticipation of Halloween, composition and processing are superb. Excellent light and colors, great shot, I like a lot. Great shot with nice horror movie feeling. Ah, yes, I remember the first set - very emotive images. Quelle image total dépouillement et cette vielle chaussure ce rendu sur le sol superbe. Stunning image. So impressive. I like the excellent treatment. Colors and treatment are superb in this image. The image has a foreboding mood about it. The image looks lonely and threatening somewhat. Fine shooting. eerie ... and striking light !!! such beautiful composition, tone, lighting & textures! You've captured such a feeling of pathos with this shot...I'm reaching for a tissue ..
@Jeff & Pat: It was a very sad place - most especially the children's areas. I like how the shoe is in the lower part of the photo. great ! very special image, well done, nice shot ! There are a lot of stories in that place, I bet. And you captured one. Wouldn't you love to hear the story? Interesting textures, but the lone shoe seems to exude the loss of life to me. Looking forward to this series. Really like the textures, good idea for Halloween. What camera do you have that you have a HDR setting on your camera? @Linda Candilas: I have a SONY alpha NEX C-3 mirrorless. The burning color does a fine job of projecting isolation and abandonment. Did you go back to Penhurst or are you mining last year's trove? @Harry: I am going back to the spring when I was there. I took many, many images and the subject is so depressing I do not like to post them for too long at a time. 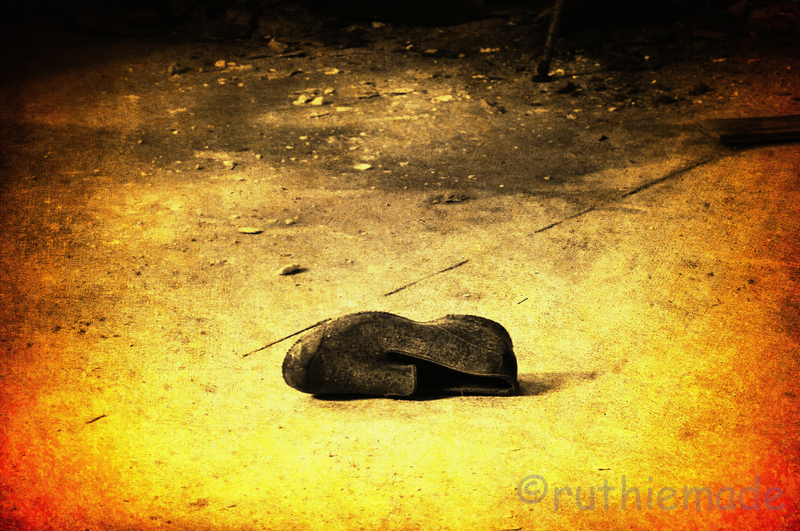 The loneliness of a lost shoe. Very cool shot and processing. Fabulous image! That single show has a story I am sure. Beautiful colors. It gives a lot to think about.